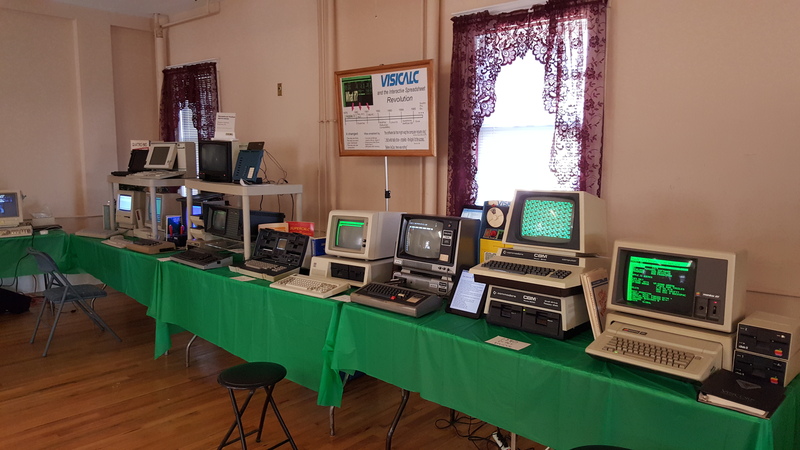 Time to blow off the dust settling on this stagnant website and post a new article documenting my experience at the Vintage Computer Fest East 10.0 (VCFEast) event. The event is over, and I’m now recuperating from the tempest of activity which filled the weekend of April 18 and 19, 2015. I’ll start with the initial activities I performed when arriving the night before, April 17th. I was one of the many exhibitors showcasing personal interest items to the public. My exhibit was an operating Video Toaster video switching system created by NewTek and operating on a Commodore Amiga 2000. I was initially assigned a single 8-foot table in the newer building. I was in the older building with my TI-99 exhibit last year, so it was a nice change of environment for me. My table was in the middle of a long wall. I had a pretty good view of many exhibits, but the cameras I was using for my Video Toaster could not “see” all of them at once. Out of the blue, I was asked if I could move to a table in the corner of the room, near the door. An exhibitor needed three contiguous tables to display a huge collection of computers running VisiCalc and demonstrating a collection of spreadsheet programs on various hardware. My table would have been the third table in line. I had no problems moving to the corner, knowing I’d be able to view the entire hall in one camera shot. The corner table had its benefits and drawbacks. My cameras could see the entire hall in one shot, and I had extra room to hang a screen for my video projector, but two large columns in the middle of the room blocked a lot of the exhibits. Very few remaining exhibits were visible from the “front.” I could only point the cameras edge-on to many of them, not being able to see their screens. I would wait and see how well things would work with the available setup. I placed my Amiga 2000 computer on the edge of the table, facing the edge. Placed my rack-mount time base corrector (TBC) on top, followed by a six outlet “power center”, with a Commodore 1084S monitor on top. 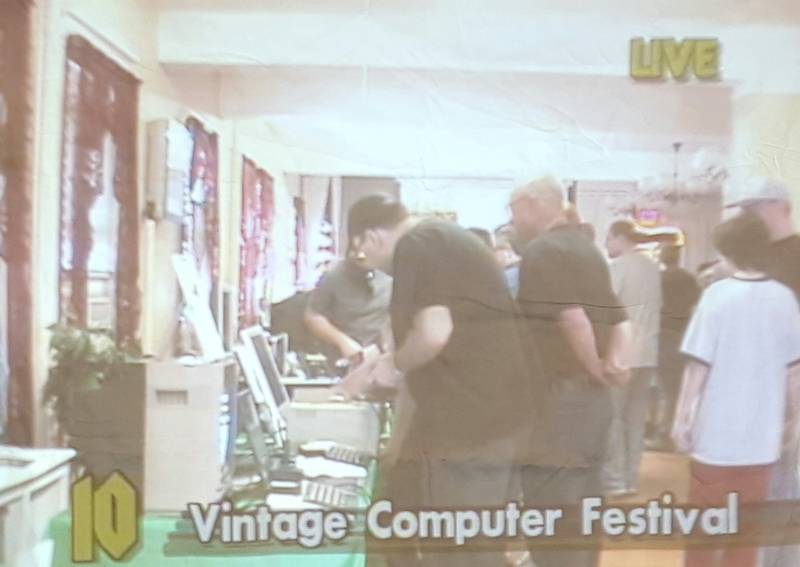 On top of the 1084S, I placed my projector, pointing at a makeshift screen I made for use last year at VCFEast 9.1 which was comprised of a frame made of 3″ PVC with a screen cloth draped over it. It’s ugly, but it meets the “no mounting on fixtures” requirement of the event. I had three cameras. Two of them were once used for video conferencing. They had full pan/tilt/zoom capabilities and operated via remote control. I put one on a tripod and the other on the top of a Commodore 1080 monitor (known as a “checkmark” monitor). The 1080 was being used as my Preview monitor for the Video Toaster, so I can view and ready a shot before switching it to the live output. The camera I placed on top is much larger than the other camera and it was too heavy for a tripod. The third camera I had was a small handheld digital camcorder that had NTSC composite out. I put that on its own tripod and set it in a fixed position to view the entire room. After adding what seemed like three miles of cabling to get everything hooked up, I fired up the system and was able to run the Video Toaster software and verify everything worked. I was lucky that it did so. I was worried about transporting the Amiga because of its special internal configuration. I was hoping certain parts and add-on boards wouldn’t break loose due to New Jersey potholes. After a few tests and camera arrangements, I went back to the hotel for the evening, hoping it would still operate the next day… and it did! On Saturday, I got in about 9 AM, to do some pre-checks and to quickly peruse the venue and have a chance to at least look at the other exhibits. As an exhibitor, I wouldn’t be able to leave my exhibit for long periods of time. Most of the detailed interaction I had with other exhibits was with those in the building I was in. At 9:30, the Keynote speaker had started and the entire place was suddenly devoid of human life… except for me. I’m not really one for Keynote speeches, so I took the opportunity to configure my system and run additional tests. This was the first time I had my Video Toaster setup on display, and for that matter, even expecting to operate for more than a few hours. I was nervous that it might go up in smoke during the show. It’s actually not a bad breakdown. I never really practiced a demonstration beforehand, but by Saturday lunchtime, I was able to present a custom demonstration for each of the above visitor types and all went well. Sunday was a repeat of Saturday’s exhibitor action, but with a difference at my table. I had been able to UStream a live image of the Video Toaster output using a mobile phone. I didn’t discover a fancy way of sending NTSC composite video through the phone. I simply placed the phone on top of the projector, aimed at the projected image. I could have just pointed the phone to the room, but then nobody would be able to see the Video Toaster effects and any of the items I zoomed in on. It was entirely a kludge that I was surprised actually worked all day Sunday. I posted the action on Twitter and received a number of viewers. I hope you all enjoyed the display. 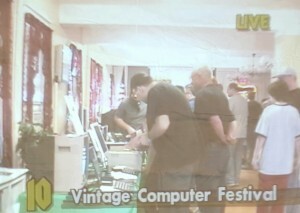 It was a rather muted video display due to the room lighting, as depicted in the image. For those who missed the live feed, you basically saw the projected video filling in about half the viewing area. I had no zoom feature on the phone, nor any place closer to mount the phone camera. You may even have seen a few inadvertent lean-in shots of balding heads that got in the way of the camera. Sunday was also the day that an exhibit on the other side of my table came in and ended up partially blocking my camera views. I then extended the tripods to full height and was able to clear most of the heads of people standing at that exhibit. When I had the chance, I captured still images of some of the exhibits in camera view and recalled them at times when no live camera had a clear view of the room. As a HAM radio operator, I enjoy the merging of vintage computers and HAM radio. Mike’s exhibit consisted of an Apple computer picking up radio-teletype (RTTY) signals from a Kenwood TS-530 transceiver and displaying the converted output. An oscilloscope was also used to visually show the RTTY signal in action. This exhibit interested me due to the similar nature of the equipment I used in the Army. As a teletype operator back then, I used an AN/GRC-106 tranceiver and UGC-74 teletypewriter to communicate using the same form of RTTY. It’s nice to see RTTY live on in a modern capacity. As an owner (and recent fan) of a TRS-80 Model IV of my own, I enjoyed chatting it up with Mike about the two Model IVs he had at the event. His exhibit gave people a chance to see a Model IV in action. Installed in one of them was a high resolution graphics card and an Orchestra 80 multi-channel sound card pumping out some respectable quality tunes. It almost sounded like a MIDI player, even though it was not. Mike also had the FreHD hard drive emulator which provides hard drive capability for the TRS-80 Model III/IV systems using an SD card. With it, he was able to call up almost any disk and file stored on the SD card without having to rely on the deteriorating quality of floppy disks. Although I’m somewhat of a purist myself (owning a REAL 5MB TRS-80 hard drive), I can appreciate these modern SD card solutions for vintage PCs. The problem for me is affording to equip all of my vintage computers with an SD card solution. Lastly, I always knew that the Model IV can run CP/M, but I never knew where to start. Mike was kind enough to fill a few floppy disks I handed him with a CP/M boot and some assorted CP/M programs to play around with. Thanks, Mike! You may have seen this exhibit on camera a few times on my UStream feed. This is the exhibit for which I was asked to move to a different table. It was an impressive display of spreadsheets running on quite a number of vintage computer systems. There was also a timeline of spreadsheets as they continued their realm of being the “killer app” all through the golden age of computing. Check out Doug’s pre-show prepatory video describing his exhibit. You may have seen this exhibit on camera a few times on my UStream feed (through a long zoom shot). Tony was my neighboring exhibitor. He had representations of nearly all Apple computers from the Apple II to the early Macintosh (and nearly a reserve supply of spare parts and systems in case of the potential release of “magic smoke”). Needless to say, his exhibit was popular. It was the first ones visitors saw after they paid their admission fee. Tony had popular apps and games running on every system and there were plenty of opportunities for people to play. In fact, he encouraged people to do so. He also tried to predict the public’s desire if they asked, “Do you have <this game> or <that program>?” by having a large collection of assorted programs on disk. If he didn’t have it on Saturday, he grabbed what he could at home that night (since he lived nearby) and had it available for Sunday. 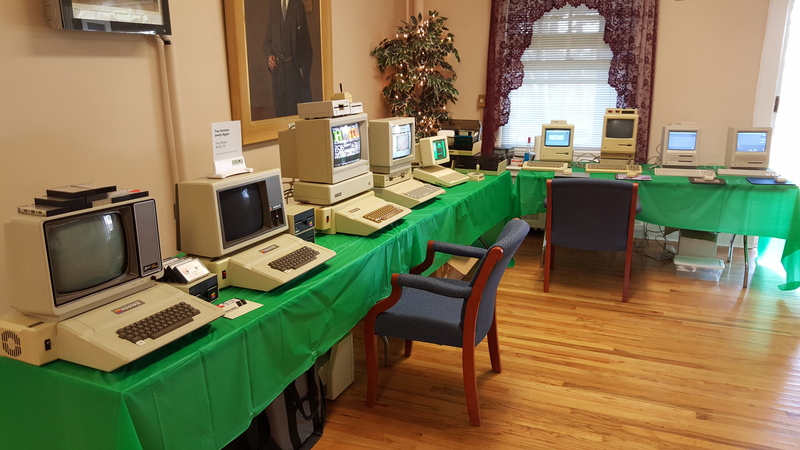 The Apple is ubiquitous in the vintage computing world, so there is little else I need to add to my description of the exhibit. Enjoy the picture! You may have seen this exhibit on camera a few times on my UStream feed, too. I didn’t spend much time at this exhibit. but it was across the room from me. I recognized the sound of a teletype machine when it was running, and it piqued my interest to go and check it out as soon as I could. When I got over there, the teletype had its cover removed and wasn’t running. 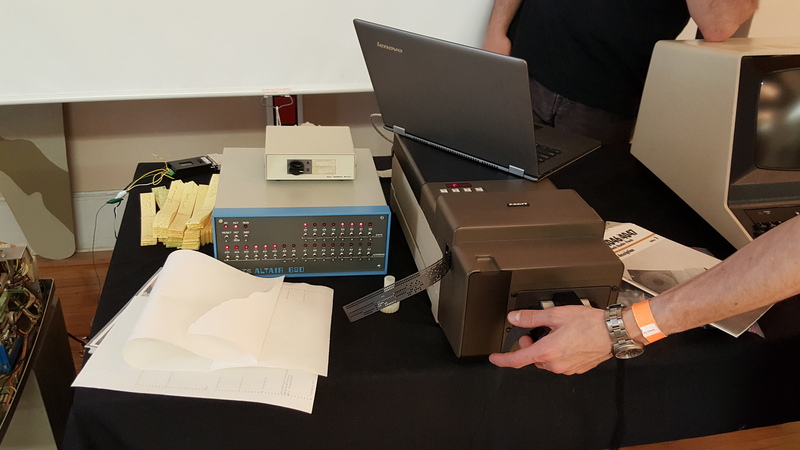 They were, however, using a Facit brand optical tape reader (never heard of one myself before this show) to load up Tiny BASIC into an MITS Altair 680, testing the transfer first by loading it up into a terminal program on a Windows laptop. I didn’t hang around long, not wanting to get too close and accidentally step on the paper tape strewn on the floor. You may have seen this exhibit on camera a few times on my UStream feed (through a long, long, long zoom shot). If I had not been an exhibitor, this would have been the single biggest reason for me to attend VCF East as a visitor. I’m a big fan of 80’s music. 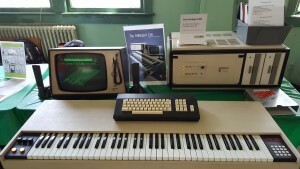 The Fairlight CMI synthesizer is the leading cause of 80’s music, and that’s a GOOD thing! Having a chance to see and hear one in person was a fantastic opportunity. Anthony showed me some details of its operation, how it loads samples from 8″ floppies, “Page R” music sequencing, and more. He even played a few riffs of some popular songs, a few which I was able to identify. I had trouble identifying some songs using only the keyboard part without the full backing of the band. Unfortunately, due to power issues, Anthony could only play two voices at a time instead of the full eight voices. I first thought I was the only one bringing a Video Toaster setup. When I learned about Matt’s exhibit, I felt like someone who attended an exclusive party, only to find out that someone else was wearing the same outfit I wore. However, Matt’s exhibit and mine complimented each other. He was using the Video Toaster to demonstrate big studio post-production editing. He had “A Roll” and “B Roll” source tapes and was producing a completed video using the Video Toaster as a primary switcher. Whereas I was using three NTSC cameras, demonstrating what could be done at a consumer level of video production almost 25 years ago. One of the biggest items (literally) at his exhibit was the six foot tall 1-inch reel to reel video tape recorder. Due to power limitations, he did not turn that recorder on as it draws a very large amount of start-up current. Unfortunately, I didn’t have much time to experience this exhibit, even considering that I am actively co-hosting the Electric Dreams BBS Podcast which is all about BBSing. What I was impressed with the most was the minimalistic completeness of the exhibit. On display was an actual phone bank, connected to a hidden tower PC running BBS software. 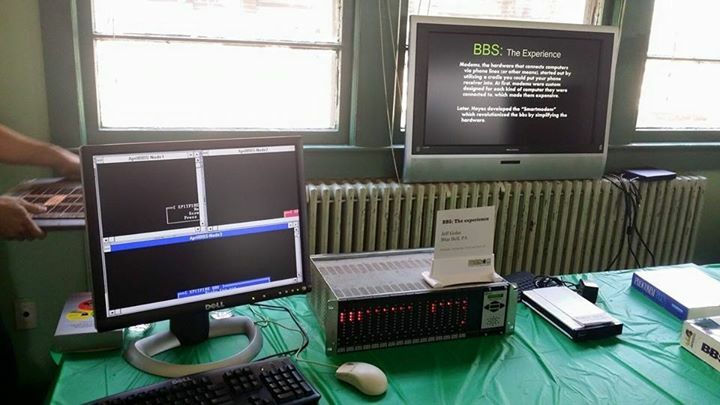 Various computers were connected to the phone bank and “dialed up” the BBS. One of the computers they were using was a Texas Instruments Silent 707 portable terminal with phone cradle. I covered the Silent 700 series in another article on this website. I wish I had more time to play at this exhibit, but I didn’t want to stay away from my own exhibit too long, and I already used up a lot of time at the Fairlight CMI exhibit. This pair, otherwise known as “The Guru Mediation” had a “30 Years of Commodore Amiga” exhibit on site, including every commercially released Amiga system along with every version of AmigaDOS and Workbench to come with those systems. 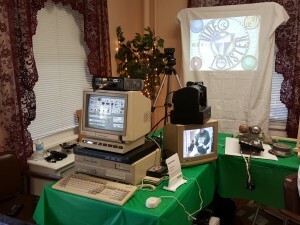 If you needed questions answered about the Amiga, you went to their exhibit. 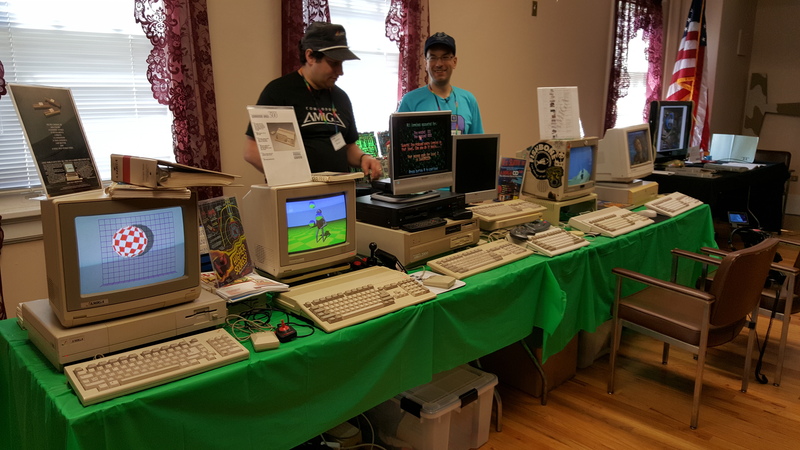 I’ll admit that even though I am well versed on the Amiga myself, I directed people to their booth if visitors had questions about he Amiga 2000 at my own exhibit, or of the platform in general. Primarily because they were only three booths away, but more so for the fact that the visitors could see the systems first hand instead of simply listening to a description. They also made a preparatory video before the event. Well, that’s about it. Most of my time on both days was spent working my own exhibit, even learning a few things about the Video Toaster that I wasn’t fully aware of. One more thing I kept track of was the collection of vintage computing stuff I brought to sell in the Consignment Room. I had two plastic tubs of assorted software and cartridges. It was leftover stuff I put up for sale last year at specific prices. This year, I posted simple pricing for everything and sold $130 worth of stuff! I yielded $114 due to the 15% consignment fee that went to the Event coffers, but it was worth it. I didn’t exactly pay for my entire trip with the proceeds, but it was nice to know that there is still value in vintage software and that others had a fair opportunity to own and use them for themselves. 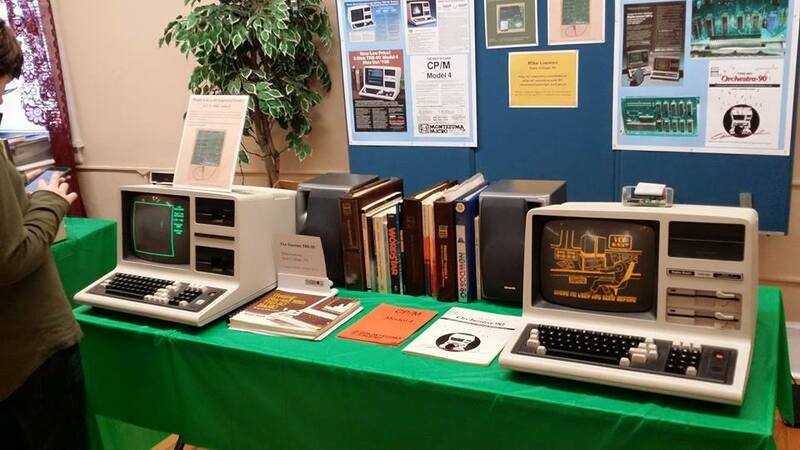 Now, if you will kindly excuse me… I have to start planning on which exhibit I’ll be bringing to VCFEast XI. 3 Comments to "VCF East 10.0"
we needed you to cover all the exhibits! Video Toaster did. I got the demo. It was the first time I saw it in action. as well as the first table would have. Thanks for your accommodation of my exhibit. I wish I had more opportunity to learn about all of the exhibits. I would have written more personal summaries of the show if I did, but to abide by the rules, I couldn’t leave my booth unattended for too long. I want to make it clear that even though I would have had better camera angles at my original table, I certainly had no problems conceding that space to your impressive collection of systems. I just hope my description of your exhibit did it justice. The computers spoke for themselves, but I hope I properly understood the philosophy of your exhibit as I explained it. I was discussing the very concept with a co-worker as to what difference a two year span of time could make back in those days of computing. The Cosmac VIP was an excellent example demonstrating a potentially missed opportunity for the single board computers to make a bigger mark for themselves in the industry. Maybe next year, you’ll get the PlaySkool computer running VisiCalc for real! I was rather surprised that my Toaster setup lasted both days without breaking a sweat. I actually have the same type of CPU accelerator board Matt had in his Amiga. Mine only runs at 25MHz, but his is set for 50MHz. I had questioned why he ran his computer with the case apart. Perhaps it does generate a fair amount of heat. Mine is packed in rather tightly, but I haven’t had heat issues for all the recent years I simply used the Amiga 2000 as an Amiga and not a Video Toaster. I don’t know exactly what failed on his setup, but even with the cover off, heat should not be a big issue. Perhaps it was contact oxidation or failing components. I did like his full A-B Roll studio setup. Brilliant article and re-cap of the show Jeff. It was a pleasure meeting you and we both enjoyed your exhibit very much. There was so much great stuff at the show it was a bit overwhelming and I wish I had more time to spend at each one. However, exhibiting for the first time was also an absolute blast. Thanks so much for mentioning our Amiga 30 booth in this article and sending people our way at the show. Can’t wait for next year!